In the East, from ancient times, people were engaged in handicrafts, and this skill was passed on from generation to generation. Masters have been developing their skills through making handmade decorative handicrafts. Oriental products are very diverse, ranging from a small lacquered box, painted in a miniature pattern and ending with large home décor products, like ceramics, jugs, vases and lanterns. All these products bring a special oriental charm to the house. 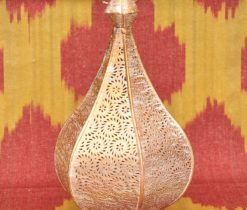 Speaking of lanterns, you can pay special attention to Morrocan lanterns, which create a peculiar play of shadows and light, which undoubtedly will add to your interior a little magic of the East. 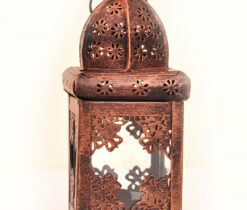 Moroccan style in the interior can be set using lighting, known throughout the world as "Moroccan lanterns." Candles give the opportunity to create a romantic, cozy and mysterious atmosphere; all candle lights have a metal base and a transparent cap that protects the flame from wind or rain. And such a candlelight is an excellent collision, since it not only protects objects standing next to fire candles, but also casts mysterious shadows on the walls of the room - there are after all candle lanterns with stained glass, carved slots and drawings. 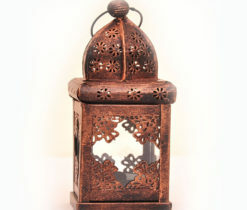 You can find Moroccan candle lantern online in our web-page and add to your interior a peace of Morocco. 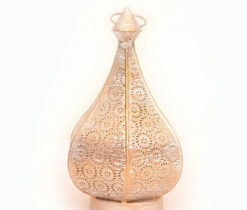 One more type of lantern is Moroccan Oil lamp which was widely used at a time when there was no electricity and this lamp worked by burning oil or fat. 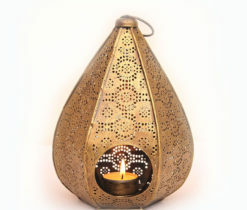 Metal candle lanterns are produced completely manually, laboriously and for a long time; first, every curl and detail is drawn from copper or brass, and then cut out. 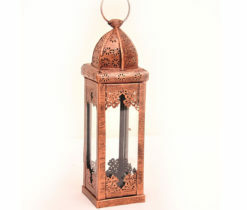 In our online-shop you can find different types of metal lanterns. 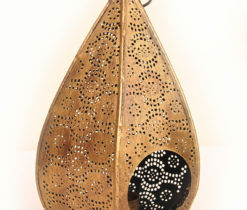 Turkish hanging lantern is made by well-known Turkish companies. The spirit of the East is perfectly conveyed in the design of lanterns through openwork metal inserts, brushes, blown glass and colored insets. There are products with hanging domes or more traditional ones, on legs. 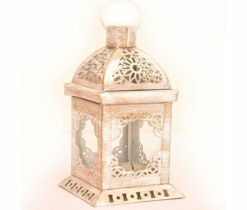 Arabic lanterns are suitable for creating a special atmosphere in a house or restaurant. They can be used as a night light, because they give a very light and pleasant light. Long time ago, lanterns have been considered a beam of light, leading souls to paradise. 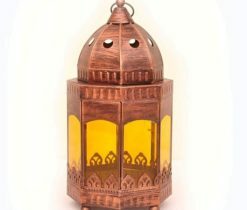 At that times lantern was a real work of art and was made of various metals, giving a mystical glow to burning oil or a candle. 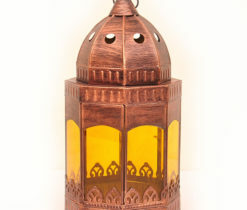 Nowadays, lanterns are used in various places, and most of them are made of brass or bronze, with the addition of painted glass. 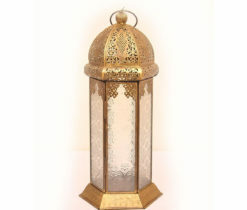 In our catalog you can find luxurious models of brass lanterns. All of them are made according to old sketches, with the use of cast decor and luxurious painted glass.